Founded in January 2014, the Vice City Players is Canberra's friendliest retro gaming group. We are committed to advancing the pursuit of leisure and friendship. Regular monthly meets featuring pinball and video arcade machines happen each month. Get in touch to join us in a few games. 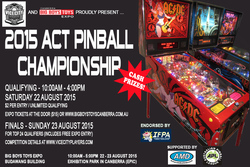 2015 ACT Pinball Championship – this weekend!